Light-emitting diode (LED) therapy, also known as low level light therapy (or LLLT) is becoming very popular as a cosmetic and medical treatment. Did you know that red light therapy was developed for NASA plant growth in space? It’s true! But since then there’s been a lot of scientific advancement in red light therapy. The aging process is accelerated by the sun! Sun and pollution can act together to destroy collagen. Collagen is the support of the skin and is the main source of elasticity and strength in our skin. Therefore, you need to protect your skin: apply sunscreen every day, even in the winter. Even though you protect your skin, we can´t avoid aging, it is a natural process. I am sure we all want to look young for longer time and we are aware about all fancy cosmetic treatments or alternative treatments as surgery. However, is very difficult to find a 100% natural anti-aging treatment. Don´t we all want to avoid chemicals on our skin? Now, fortunately technological advances make it possible. Red light therapy for skin is becoming a very popular alternative, chemical-free treatment. It has already been scientifically demonstrated to be effective in the treatment of sun damage (Baez et al. 2007, J of Cosmetic Dermatology). How does red light therapy work? Certain light wavelengths stimulate collagen synthesis and accelerate fibroblast–myofibroblast transformation, leading to a rejuvenation effect. Some red light therapy users report noticing a difference within days. A few say they saw a difference after only one treatment session. It’s hard to tell which is the main advantage- getting a quick effect without any pain or getting it without chemicals. Let’s consider for a moment what acne is. It is a skin infection of Propionibacterium acnes. This bacteria is becoming very resistant to traditional acne treatments and we need alternative solutions, so blue light therapy is a very welcome advancement. As an aside, red light therapy for acne may also be a helpful treatment. It seems that it helps skin’s oil glands to reduce cytokines, decreasing inflammation and redness. This female patient had her first outbreak of acne at the age of 17. Baseline (a) and after the eight-week treatment period (b). The total number of lesions had reduced by 62 percent. How it Works: Certain wavelengths of blue light are used to develop reactive oxygen species that kill the bacteria. Depending on the strength of the light used, these treatments can result in redness and flaking for several days. Benefits: Blue light therapy is effective, is painless and no chemicals or antibiotics are used. You can do it on your own using an at-home blue light therapy bulb or device. When to use: Blue light therapy works best for mild to moderate inflammatory acne. It can be used on severe acne as well. Cons: Blue light therapy can be expensive if is done by a doctor (requires multiple sessions). Blue light therapy treatments are not always effective for cystic acne or blackheads- its effectiveness in these conditions appears to be person-specific. It’s a newer treatment, so long term effects are not as well known as, say, peroxide treatments. 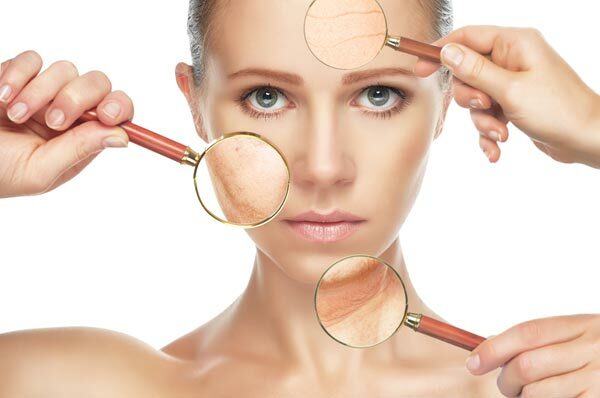 Wrinkles are signs of aging and nobody wants to have a face looking like a road map. Fortunately, now we have the option of light therapy for skin. How it Works: Mainly, using certain red light wavelengths causes new collagen to be produced. Remember that collagen is the main support of our skin. The red light helps to improve the ability of the skin to retain key elements that are used to generate new collagen. Benefits: No pain at all. You can avoid chemicals and it is very effective not only at reducing signs of aging such as wrinkles, but also at controling acne. There are home-use red light therapy bulbs and devices available on the market. Some are quite affordable. Cons: Some devices can be expensive. You need multiple treatment sessions (which could be very expensive if you opt for having treatments done by a medical professional). Time consuming: you need a bit of patience to see results. Before buying any red light therapy (or blue light therapy) bulb or device you should remember that there’s infrared light therapy that can cause harm. Please buy from reputable manufacturers and research safety and usage instructions before starting to use the device. You should know that there are laws controlling the production of these type of devices. Producers have to use lower wavelength intensity than the lasers medical professionals use. Don’t overdo the treatment. More is not better. Please read and follow the instructions and safety information. Be patient. The effects may take a few weeks to see. Use eye protection. Never stare directly into the light. Remember that the FDA approves based on safety, not necessarily effectiveness. Research scientific results for safety and effectiveness. Finally, I need to conclude this article with some tips to keep in mind and help you to make a decision about whether red light therapy or blue light therapy (or some infrared light therapy) is right for you. When it comes to acne, consult with a dermatologist first. Get a diagnosis- acne can come in different forms and some conditions mimic acne. Remember that treatment effectiveness depends on the type of acne you have. Traditional acne skin-care products and other medical options are the options where you should first start. For anti-aging, red light therapy is a great complementary option. It does not mean that you don’t need an appropriate skincare routine. Together the two can give you wonderful results. 1. Cleanse with a gentle cleanser each day and night. 2. Exfoliate to remove dead skin cells. 4. Hydrate. Use a moisturizer appropriate for your skin type. 5. Protect your skin from sun damage by using sunscreen. And if you decide to try LLLT keep in mind: be consistent and patient! If you want to invest the money in one of the at-home bulbs or devices, you need to be committed (don’t waste your money if you are not going to use it). Not sure? Go and see your dermatologist and ask if LLLT is for you. This entry was posted in Red Light Therapy and tagged light therapy for skin, red light therapy for aging, red light therapy for wrinkles by Bambi. Bookmark the permalink.